← African Voices Podcast: Episode 12! The United African Organization would like to thank everyone who helped plan and/or attended the African Unity Gala and Awards! The event was a great success, and we are grateful to the entire community for getting the word out and helping promote UAO’s work. Those who attended enjoyed great food from all across the continent as well as music by Nigerian-American Afro Soul singer Ugochi. UAO would like to thank our sponsors: Prudential, Peoples Gas, Urban Partnership Bank, Alice Cottingham & Associates, Ethiopian Community Association of Chicago, and AceXtic. Special thanks to our in-kind sponsors who helped make the event special. UAO awarded two scholarships worth $2,000 this year to honor the memory of Sgt. Albert Dono Ware. The 2012 Awardees are Amadou Barrow at the Illinois Institute of Technology and Daniel Owusu-Bempah at University of Illinois in Springfield. Congratulations to these individuals for their commitment to academic excellence and unity in the African diaspora community! 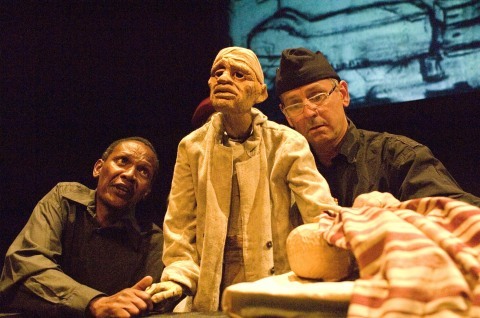 The South African Handspring Puppet Company performed Woyzeck on the Highveld at the Museum of Contemporary Art (MCA) from September 27th to 30th. The play is about a migrant worker in South Africa under apartheid named Woyzeck. He is caught in an existential dilemma. He struggles to find meaning in his life and prove his masculinity in a emasculating position as a migrant worker and test subject. This pressure causes him to eventually lose his mind and fill his wife and himself. The play was a great success. The audience was amazed at the detail of the puppets and the story line. Handspring puppets were very lifelike and the inclusion of drawings and music also provided great depth to the play. The Kenyan community held a Marathon Dinner on October 5th at Moody Church. The event was well attended, especially by young Africans. At the dinner, the runners talked about what motivated them to run and what running has taught them about life. UAO would also like to congratulate Tsegaye Kebede of Ethiopia for shattering the course record and winning the Chicago Marathon on Sunday morning with a time of 2:04:38! On October 6th, the Nigerian Community of Chicagoland held their annual independence parade. The event started at 11am on Sheridan Rd and went from Foster Ave to Sunnyside. The event went well and lots of people were in attendance. It was a great day to celebrate Nigeria! The Ugandan Community of Greater Chicagoland held their Independence Day Celebration on October 6th. UAO’s Executive Director Allie Kabba spoke at the event about the importance of pan-African unity. The event was a great celebration of fifty years of independence. The event had a wonderful atmosphere and good food and music. Schiller Woods. This event allowed their members to enjoy the final days of warm weather in Chicago, meet other TCA members, and plan their next big event. UAO would also like to congratulate Tsegaye Kebede of Ethiopia for shattering the course record and winning the Chicago Marathon on Sunday morning with a time of 2:04:38! Four Nigerian Farmers are currently in legal proceedings against Shell in a Dutch court. They argue that Shell broke the law by not repairing leaks that destroyed the lands of Niger Delta farmers. Many people are eagerly watching this case because they feel it could set a precedent for global environmental responsibility. The four Nigerian farmers, backed by lobby group Friends of the Earth, have brought the Anglo-Dutch oil giant into court thousands of miles away from their homes with a civil suit that could open the door for hundreds of similar cases. Their lawyer Channa Samkalden told the court that Shell has “violated it legal obligations” as “Shell knew for a long time that the pipeline was damaged but didn’t do anything.” She and her clients believe that shell could have and should have stopped the leaks. The case relates to damage caused in 2005 and was initially filed in 2008, demanding that Royal Dutch Shell should clean up the mess, repair and maintain defective pipelines to prevent further damage and pay out compensation. Environmental groups have accused Shell of double standards and treating spills in Nigeria differently from pollution in Europe or North America. Youth riots in Egypt and Libya turned deadly on September 11th. The US ambassador to Libya Christopher Stevens, his state department colleague Sean Smith and former Navy Seals Tyrone Woods and Glen Doherty, all died during the protests at the Benghazi Embassy. They died of smoke inhalation after the protester set the building on fire. These protests were reportedly sparked by a youtube video called “The Innocence of Muslims” which mocks Islam and the prophet Muhammad. However, the US state department is still trying to figure out if these protests and the violence which ensued were premeditated. Ivory Coast decided to reopen its Eastern border with Ghana after being shut down for two weeks. This shutdown was in response to a series of deadly attacks that were believed to have been planned and launched in Ghana. In order to curb further attacks, the country plans to tighten security to try and stop future attacks. Kenyans have staged a protest in the capital Nairobi against a vote paving the way for members of parliament to be paid $110,000 send-off bonus, with money expected from tax increases. Kenya’s President Mwai Kibaki has vetoed the country’s legislators attempt to provide large bonuses to themselves. However, the president said that this action was unconstitutional and untenable in the country’s prevailing economic circumstances. Kenya’s 222 legislators currently each make around $13,000 a month of tax-free income. Yet, the minimum wage in Nairobi, the capital, is about $1,500 a year. Libya’s parliament ousted the country’s newly elected prime minister in a no-confidence vote on Sunday. Mustafa Abushagur was Libya’s first elected prime minister after last year’s overthrow of dictator Moammar Gadhafi. He represented an offshoot of the country’s oldest anti-Gadhafi opposition movement, and was considered a compromise candidate acceptable to both liberals and Islamists. He had 25 days from his Sep. 12 appointment by parliament to form a Cabinet and win the legislature’s approval, but that deadline expired on Sunday. The Congress voted 125 to 44 in favor of removing him as prime minister, with 17 abstaining from voting. He had just put forth 10 names for key ministerial posts Sunday when the no-confidence vote was held. Until a replacement can be elected by the parliament, management of Libya’s government is in the hands of the legislature. Libya’s Congress will vote on a new prime minister in the coming weeks. Angolan authorities have recently started cracking down on illegal immigrants. The country’s Migration and Foreigners Services (SME) announced plans to deport up to 539 illegal immigrants, Jornal de Angola reported. The majority of these undocumented immigrants are from the Democratic Republic of the Congo. Thousands of Congolese slipped into Angola after attacks by militia in the east of the troubled Central African country. The influx has caused friction with locals. Deportations of DRC nationals from Angola began in 2003 just after the end of the southern African nation war (1961 to 2002), when it began tightening its borders and reinforcing national security. SME’s spokesman Simao “This week alone, 422 illegal foreigners were detained, following tip-offs,” Authorities in Luanda have vowed to significantly reduce illegal migration to the oil rich nation. This month the United African Organization will be kicking off its African Community Leadership Development Program with the topic Building Organizational Capacity. This workshop will focus on the following: acquiring 501 (c) 3 status and managing non-profits. It will be held on October 27th from ten to noon at the IIT Tower building on the sixth floor. The address for this building is 10 W. 35th St. This month’s Citizenship Workshop will be held on October 20, 2012 from ten to noon at the Muslim Women Resource Center at 6349 N. Western Ave. Please tell let your friends who are interested in becoming citizens to come to this free event. The Afro Entertainment Awards will take place on October 27, 2012 from 5 – 11 pm at the McCormick Auditorium, which is located at 3241 Federal St. This event will be a night to celebrate African entertainment and the arts. For more information, please go to www.afroawards.net. children with disabilities and the US Education system. This month’s recipe is for Liberian Ginger Beer. Ginger beer is a spicy and tasty drink fit for any occasion. Also, since it’s made with ginger root it is full of vitamins and minerals, so you don’t have to feel guilty drinking it. It also is believed to help relieve sore throats, nausea, motion sickness, arthritis, and other cold symptoms.There are two ways to make ginger beer, either with or without yeast. Using yeast allows fermentation and takes longer to make. So just to simplify things today, we will be making ginger beer without yeast. To make ginger beer you need a blender, 2 pounds of ginger root, 1 cup of sugar, 1 ripe pineapple, 14 cups of water, and between a teaspoon and a tablespoon of whole cloves. Step 1: Wash your ginger root. Use a cutting board and small, sharp knife to cut into half-inch pieces. Step 2: Transfer a half of the cut ginger into the blender. Add 2 cups of water. Cover and set blender to grate or high. Blend until ginger is in small pieces and mixed in the water. Transfer this mixture to a deep (8 quart) pot. Repeat with the rest of the ginger. Add this mixture to the pot. Step 3: Wash the pineapple. Use a sharp knife to remove the peeling. You should slice the peeling off so that you also remove a half-inch of pineapple with the skin. Step 4: Cut the peeling into one-inch pieces. Transfer a half of the cut pineapple peeling to the blender. Add 2 cups of water and blend on high until pineapple is in small pieces and mixed in the water. Transfer to the pot of ginger. Repeat with the rest of the cut pineapple. Step 5: Add to the mixture in the pot. Step 6: Add 6 more cups of water to the pot. Add cloves. Make your first batch with 1 tsp and decide if you want a stronger flavor. Step 7: Half-cover the pot with the top. Bring to a boil on high and boil on medium-high for 30 minutes. Step 8: Remove the pot from the stove. Cover the pot completely and allow the mixture to sit for 8 hours or overnight at room temperature. Step 9: Pour the mixture through a metal sifter to remove the larger pieces of ginger, pineapple peel, and cloves. Use a cook spoon to press help force the liquid through the sifter. Step 10: Use a clean cotton kitchen cloth to strain out the finer particles. You will have to use your hand to squeeze the ginger beer out of the cloth. Step 11: To sweeten, add 1 cup of sugar and stir. Add more sugar according to your taste. Cut and squeeze in lime, if desired. Chill and enjoy. You can enjoy the unused pineapple while you wait for your ginger beer. Yaba Angelosi is a Sudanese singer and entertainer from Juba. He was born in South Sudan, but his family moved to the US in 2000. Soon after, he started performing as an artist and connecting his music to his Sudanese heritage. One Response to Happy 1st Birthday, African Voices! Another very, very interesting acritle. I think it’s a shame how African American artists have been overlooked, but this has changed now and I am glad about it. I think there is so much treasure and so much soul in African American art.